The four characteristics: cut, carat (weight), clarity, and color determine how much a diamond is worth. Diamond proportion is very important. 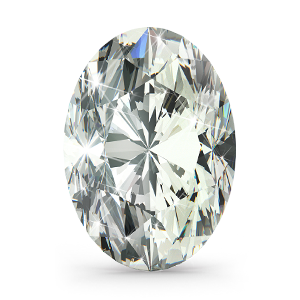 Round brilliant diamonds are usually cut with 58 facets. 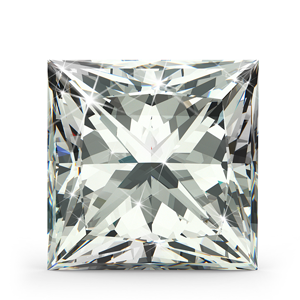 The proportionional similarity of these facets on the diamond affect how much light will be reflected to the viewer. The better the cut, the more the diamond will sparkle. Ask for the table percentage. A good table percentage is between 55-60%. 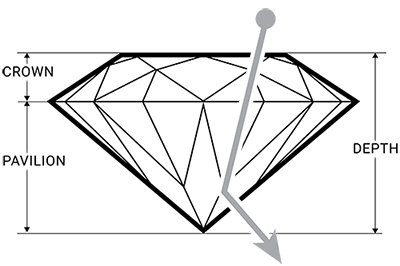 How does pavilion depth affect a diamond's cut? A pavilion depth that’s too shallow or too deep will allow light to escape from the side of the stone or leak out of the bottom. 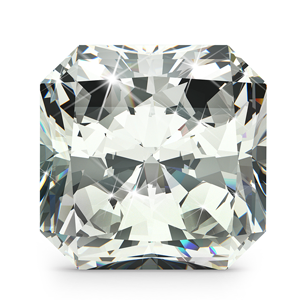 A well-cut diamond will direct more light through the crown, creating maximum brilliance. Cut also determines the shape such as pear, round or oval. When having a diamond mounted, appraise and record the stone's measurements which never change. After the stone is mounted, verify that it matches the measurements and/or appraisal certificate. Carat is the measurement of a gem's weight. Larger gems often cost more per carat because of their size. There are 100 points to a carat. 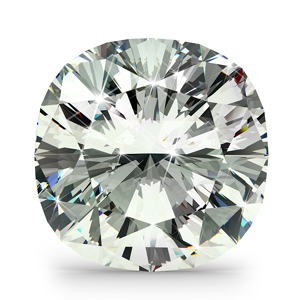 A 50 point diamond equals 1/2 a carat. One gram is 5 carats. 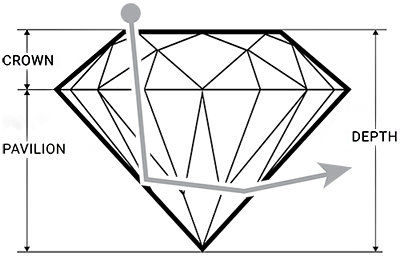 Ascertain the actual point size of a diamond instead of the fractional weight. Some jewelers will try to sell a .90 diamond as a 1 carat diamond which would be much more expensive. Flawless: perfect inside and out. Internally Flawless: might have minor blemishes on the outside. VVS1, VVS2: have very tiny inclusions. VVS1 inclusions are only visible through the pavilion. VVS2 inclusions are slightly larger. VS1, VS2: have very small inclusions. VS1 inclusions are smaller than VS2 and harder to detect. SI1, SI2, SI3: have small inclusions. I1, I2, I3: have inclusions that can be seen by the naked eye. Colors range from D - X for white and yellow diamonds. D is the whitest. At S they are "Fancy" yellow Diamonds. There are also, pink, red, green, blue and brown diamonds which are typically irradiated. Always ask for a guarantee of the color and clarity, as some states permit dealers to be off on color or clarity by one grade. 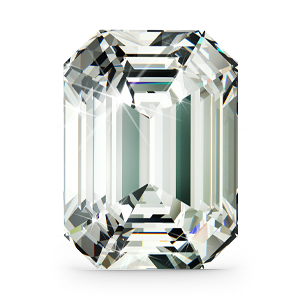 Diamonds are sometimes filled for clarity, and irradiated or painted for color. 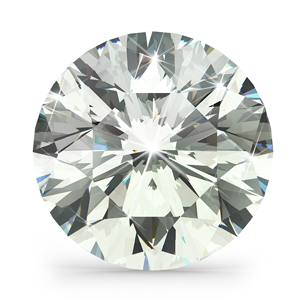 Diamonds with inclusions can be filled with glass to make them seem clearer. This does not fix the inclusion, just covers it. A filler can be damaged by heat, ultrasonic cleaning, and by re-tipping. Look at the filled diamond closely and rotate it under light, you should be able to notice a bluish flash. Diamonds that are irradiated for color may be affected by heat. Paint on a diamond to offset a yellow tinge wears off rather quickly. If the diamond is represented as not being treated, get a notarized statement from your jeweler saying so. Many states require dealers to tell you about these treatments by law. Diamonds are commonly believed to be unbreakable, which is not the case. Don't wear diamonds when doing heavy activities and always protect them from scratches and sharp blows. To avoid scratching, keep diamonds stored separately from each other and other jewelry. The best way to clean a diamond is to use a jeweler's polishing cloth. 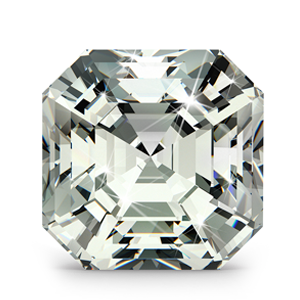 BRILLIANCE: The intensity of white light reflected through the top of the diamond. CROWN: The top part of a diamond, from the girdle to the table. 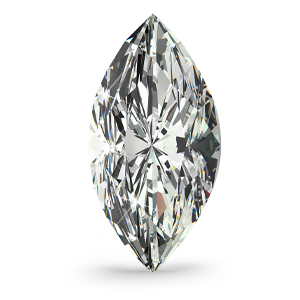 CULET: The bottom facet at the tip of the diamond. DEPTH: The height of a gemstone, from the culet to the table. 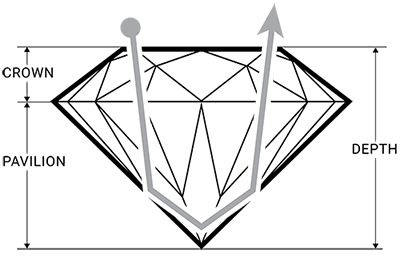 DIAMETER: The width of the diamond, measured around the girdle. DISPERSION: The result of white light splitting into all the colors of the rainbow. 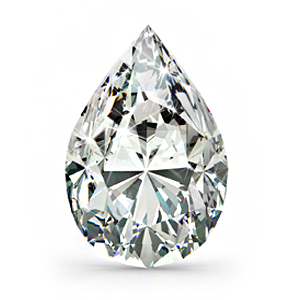 EYE CLEAN: A term meaning no flaws are visible to the unaided eye when viewed from 12 inches away, with the diamond face up. FACE UP: The diamond viewed from the top of the stone. FACET: The flat, polished surfaces on the diamond. All Variety Gem diamonds have 57 facets. FIRE: When moved, these are flashes of color reflected from within a diamond, resulting from dispersion. Just like a prism, white light entering a diamond separates into all the colors of the rainbow. FLAW: Any external or internal imperfection in a diamond. FLUORESCENCE: The luminescence exhibited in certain diamonds when exposed to ultraviolet light or strong sunlight. Fluorescence is most commonly blue in color, but can also be a variety of other colors. GIRDLE: The narrow band encircling the widest part of a diamond. It may be faceted or non-faceted. INCLUSION: An impurity within a diamond. Inclusions may or may not be visible with the unaided eye. Fewer inclusions ensure a finer clarity grade. PAVILION: The bottom part of a diamond, from below the girdle to the tip of the culet. POLISH: The smooth, shiny finish on the facets of a diamond. Ideal polish is critical for maximum diamond brilliance. PROPORTIONS: The cutting quality relative to the depth percentage, table percentage, girdle percentage, symmetry and crown and pavilion angle. 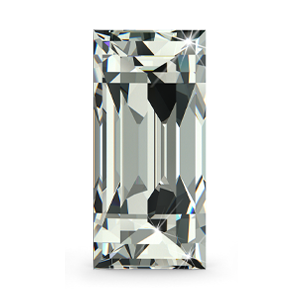 Proportions influence light refraction and reflection within the diamond. 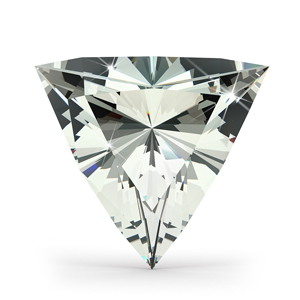 SCINTILLATION: Flashes of reflected light from a diamond when it moves. Commonly referred to as sparkle. SYMMETRY: The overall uniformity of a stone's cut, which can range from poor to Ideal. The symmetrical alignment of facets makes for a more stunning diamond. TABLE: The largest, flat facet on the top of a diamond. Diamonds may be the hardest substance on earth, but they are not indestructible. While they can be cut or polished only by another diamond, a hard blow can cause them to chip. Never wear your diamond jewelry when doing rough work. Don't store your diamond jewelry next to other jewelry pieces as this can cause scratches. A fabric-lined jewelry case with separate compartments is Ideal. You can also individually wrap jewelry in soft tissue paper or use jewelry pouches for each piece. Regularly inspect your diamond jewelry to make sure the setting is secure. Promptly bring it to a professional jeweler if you notice any signs of damage or loosening of the prongs. It's a good idea to have your diamond jewelry examined at least once a year by a professional jeweler. In addition to performing any necessary repair work, your jeweler can expertly clean your jewelry. Everyday exposure to creams, skin oils, hairspray, household chemicals and other substances can cause buildup that will dull your diamond's brilliance and sparkle. Use a solution of warm water mixed with a few drop of ammonia in which to soak your diamond jewelry. Gentle scrubbing with an old, soft-bristled toothbrush is useful for more extensive cleaning. Rinse and dry with a clean soft cloth. Handle your diamond sparingly, as your fingers provide enough oil from your skin to alter the way your diamond looks. Clean your diamond regularly. A simple plan to keep your diamond jewelry always looking beautiful is to soak the diamond in an ammonia-based household cleaner (such as window cleaner) overnight, once or twice weekly. In the morning, remove the diamond from the cleaner and brush it with a soft, clean toothbrush to remove any leftover dirt. Take extra care to brush the back of the diamond as this will be the area that has collected the most oil and dirt. Be aware that fragile settings and estate jewelry won't take kindly to being scrubbed with a toothbrush, so use a soft touch. Then, just rinse the diamond with water and wipe with a soft, lint-free cloth. Don't use harmful solutions. 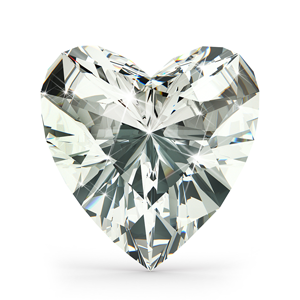 Chlorine or abrasives should never be used when cleaning diamonds, especially those set in jewelry. These erode some of the metals often used in diamond settings, and may loosen prongs, or even dissolve the metal completely. Sometimes an ultrasonic cleaner is necessary to remove encrusted dirt on diamonds. By sending high frequency sound waves through a detergent solution, ultrasonic cleaners cause vibrating fluid to remove accumulated dirt and grime. However, they can also shake loose stones from their mounting, so this method shouldn't be used on fragile settings, and is best undertaken by a professional jeweler. Regular cleaning will keep your diamond jewelry in gleaming condition and ready to sparkle on that special occasion. Even though you may wear your diamond ring 24 hours a day, you should still give thought to its care. Don't wear it when you're doing rough work. Even though a diamond is durable, it can be chipped by a hard blow. Don't let your diamond come in contact with a chlorine bleach when you're doing household chores. It can damage and discolor the mounting. Do see your jeweler at least once a year and have him check your ring and other precious pieces for loose prongs and wear of mountings. He'll usually give them a professional "shine-up" too. When you're not wearing diamonds and precious jewelry, they still require attention.Keep your precious pieces in a fabric-lined jewel case, or a box with compartments or dividers. lf you prefer to use ordinary boxes, wrap each piece individually in tissue paper. Don't jumble your diamond pieces in a drawer or jewelry case, because diamonds can scratch other jewelry-and can even scratch each other. Don't leave your ring on the rim of a sink when you remove it to wash your hands. It can easily slip down the drain. Copyright © 2018 by Manhasset Jewelers. All rights reserved.